Baby Hammock Swing. Reversible Designer Fabric . 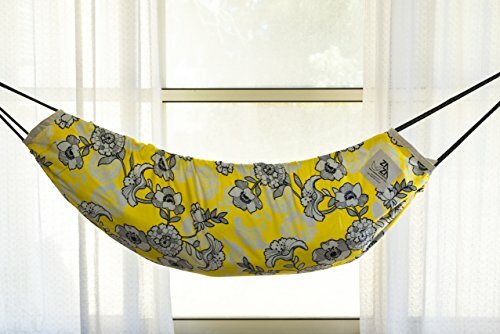 Zaza Nature Baby Nest, Swinging Seat Hammock For Babies, Children and Teenagers. The Zaza Hammock is a versatile Hammock for Babies and Children. Hanging from 2 anchor points above, the hammock can easily turn from a soothing swinging cradle for newborns to toddlers, to a swinging seat, hammock chair, suitable for toddlers, kids and teens. Extra durable, extra natural, the Zaza Baby hammock baby nest is made of two sides super strong, natural cotton fabric. ZAZA hammock - A wonderful baby hammock, doubles as a play-hammock and swing for older kids. Zaza Hammocks can be easily hung indoors, or outdoors, and are made to grow with your child - from a swinging crib for newborns and toddlers, to a camping hammock for children, or a swinging seat for children and teenagers. Zaza Hammocks are also recommended by occupational therapists as therapy swings for children. A fantastic piece of children's decor, great addition to any child's playroom or nursery. This hammock is a great daytime crib for babies who need to be rocked and cuddled a lot (don't they all?!). It is easily adjustable to suit your growing baby's needs - hanging from two points from above, makes a cozy crib suitable for babies and toddlers adding a pillow will make a comfy bed for bigger babies, slightly adjusting the ropes will make a great swinging seat for older children. Hanging horizontally, makes a safe hammock for kids, which will not flip over as adult hammocks often do, Made of sturdy cotton fabrics (new, industry surplus fabrics) and heavy duty professional ropes and karabiners, the hammock comes with extra ropes for hanging from beams or branches when outdoors, a carry bag and instructions. The hammock can be easily hung from ceiling, walls, branch or beam, it is very lightweight and comes with a handy carry bag so you can easily take it with you when you think your baby might want a nap outdoors. Machine washable. If you have any questions about this product by ZazaHammocks, contact us by completing and submitting the form below. If you are looking for a specif part number, please include it with your message.